The ADP3421 is a hysteretic-voltage-programmed DC-DC buck converter controller with two auxiliary linear Regulator controllers. The ADP3421 provides a total power conversion control solution for a Microprocessor providing the core, I/O, and Clock voltages. The optimized low voltage design is powered from the 3.3 V system supply and draws only 10 A maximum in shutdown. The main output voltage is set by a 5-bit VID code. To accommodate the transition time required by the newest processors for on-the-fly VID changes, the ADP3421 features high-speed operation to allow a minimized inductor size that provides the fastest change of current to the output. To further allow for the minimum number of output capacitors to be used, the ADP3421 features active voltage positioning that CAN be optimally compensated to provide a superior load transient response. The main output signal Interfaces with the ADP3410 dual MOSFET driver that is optimized for high speed and high efficiency for driving both the upper and lower (synchronous) MOSFETs of the buck converter. 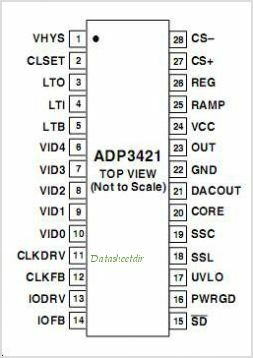 This is one package pinout of ADP3421,If you need more pinouts please download ADP3421's pdf datasheet. This is one application circuit of ADP3421,If you need more circuits,please download ADP3421's pdf datasheet.